Batik sarong or sarung (the way we spell it here) is a must item in everyday Malay's life. Basically, it is a length of fabric, sewn at the end to form a sort of tube. The men's sarong is called kain pelikat, with checkered type of pattern on the cloth; while the women's would be the authentic batik sarong. However, men in the eastern coast of peninsular Malaysia such as Kelantan and Terengganu, do wear the kain batik as their longing at home wear. Nowadays, sarong is well known worldwide. This lens is to highlight the history and versitility of a piece of batik sarong. 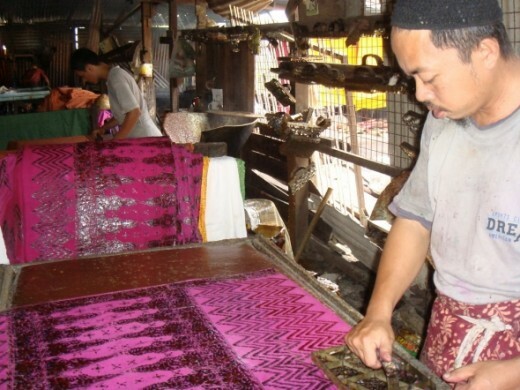 How a Batik Sarong is Made? The Malaysian sarong is basically a batik sarong. It basically is a length of fabric measuring about a yard wide and length around two and a half yard. There are three parts to a sarong which is the head, body and leg. The "kepala" or head is a foot wide area located in the centre of the sarong which would be stamped with a batik chop pattern forming a panel of batik design which would be usually contrast from the body of the batik. The leg would be stamped with a batik chop alongside its width to indicate that it is the bottom of the sarong. 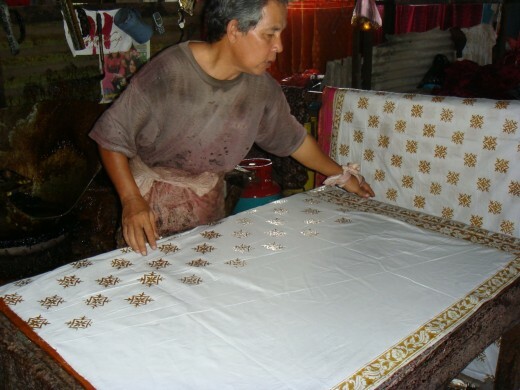 Batik sarong creation begin with a length of white cloth (usually the same length as the finished sarong) spread on top of a special table which had a layer of thin sponge layered in between the sturdy wooden table and plastic covering. Water would be placed to wetten the table surface. A chop which is actually a stamp would be dipped in hot wax before being applied to the white cloth. Different kind of chop would be used to create the head, body and leg of the sarong. This process is repeated until the desired pattern is created. Afterwards, the cloth would be dyed in the desired colour. The process of stamping and batik and the dyeing of the batik would be repeated again and again until the desired colour and design is a achieved. After the dye had dried, the batik would be soaked in a silikat solution to ensure the permanancy of the day for up to 8 hours. Then, the cloth would be boiled to removed the wax. The intricancies of the batik pattern and their colour would emerged at this point. The batik sarong would be rinsed in clean water and hung to dry. It is now ready for use! 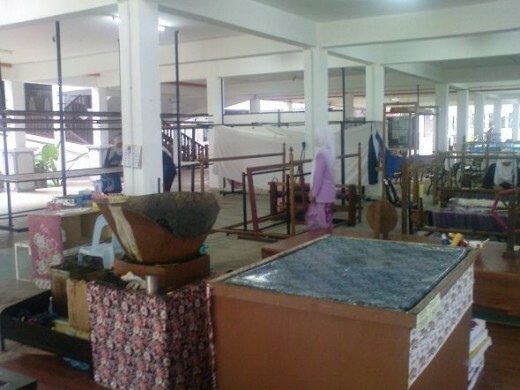 A batik chop workplace. 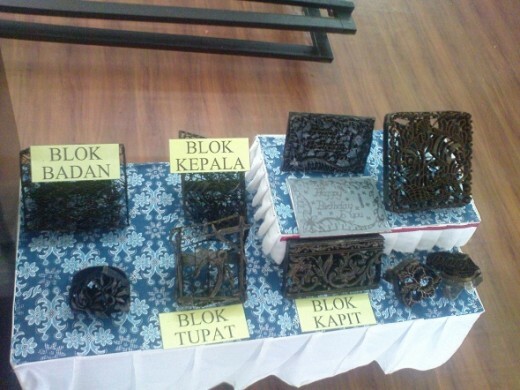 You can see the table for stamping the batik. The blacked pot there is where the wax is boiled in order to facilitate the stamping of pattern onto the white cloth. A batik bedsheet. This one is king sized. Nice item to bring tropical ambiance to any home. Different type of chop for different part of batik sarong. Batik and Kebaya making a comeback. Here is Mas Idayu, a modern Malaysian singer posing in the classic essamble. Nowadays, sarong has gain popularity as a beachwear. Similarly, before the 20th century, Malay ladies wears batik as a "kemban" - the batik would be just the sarong tied above the chest area be it at home or in the public. After Islam came to Malaya (as Malaysia was previously known then), the dressing had become more modest. Batik is then used as a skirt, tied on the waist area while on top they would wear a baju kurung (a type of knee length loose blouse) to cover their shoulder and chest area. Wearing the batik sarong is simple. First, ensure that the sheet of batik had been sewn alongside it height to form a tube. Step into this tube, pull the batik up on the navel level (ensure that the hem in on line to the ankles). 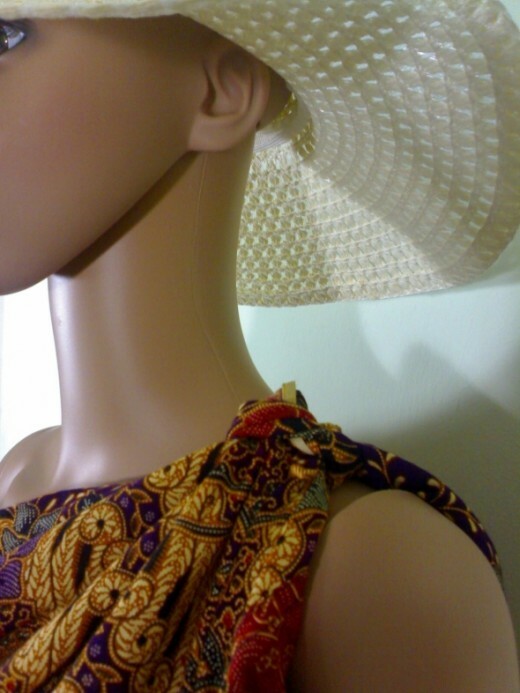 Ensure the head is at the the cebtre of your back while both hands holding the side of the sarong, fold on side of the batik to your waist level in front, fold another side a bit lower from the first fold and then tuck the end at the waist area. 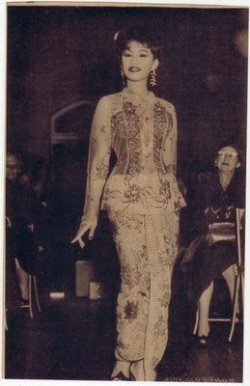 Pictured here is Saloma, Malaysia's top diva be it in singing and acting in the 60s looking splendid in batik sarong and lacy kebaya. 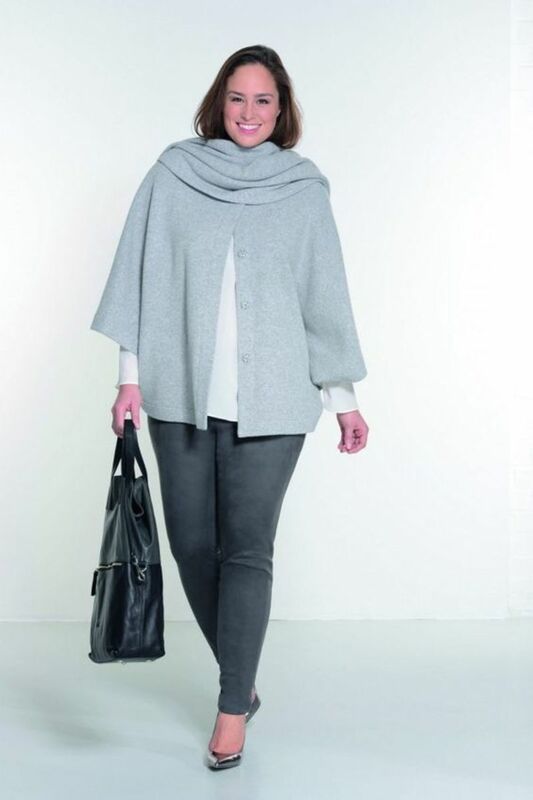 This fashion will disappear of radar once in a while, but will always make a comeback from time to time. A classic Malaysian fashion! Basically there is no right or wrong way of wearing the sarong. 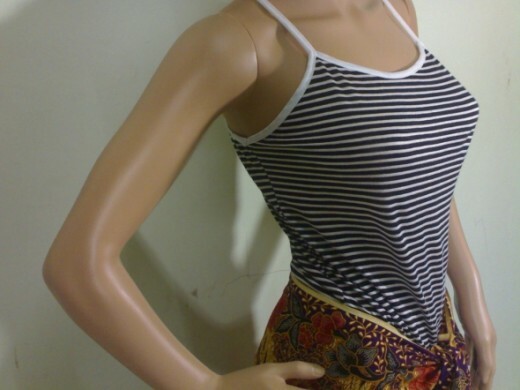 Here is a model showing the easiest way of tyeing the batik sarong which is the tube style. Check out their other videos of using the same sarong and tied into A Line Knot Tie, A Line Fold and Halter Neck Batik. Lovely versatile batik sarong, pareos and wrap for anywhere, any time, any occasions. 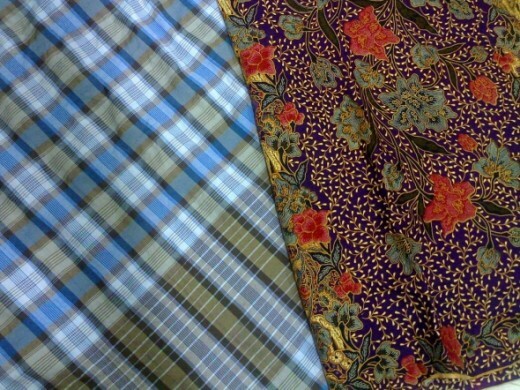 A kain pelikat for guys and a batik sarong for ladies. Tucking the end of a batik sarong side securely at the waist. Fold a batik sarong into half and it become a mini skirt. Fold the entire width on top of the sarong to keep it secure. 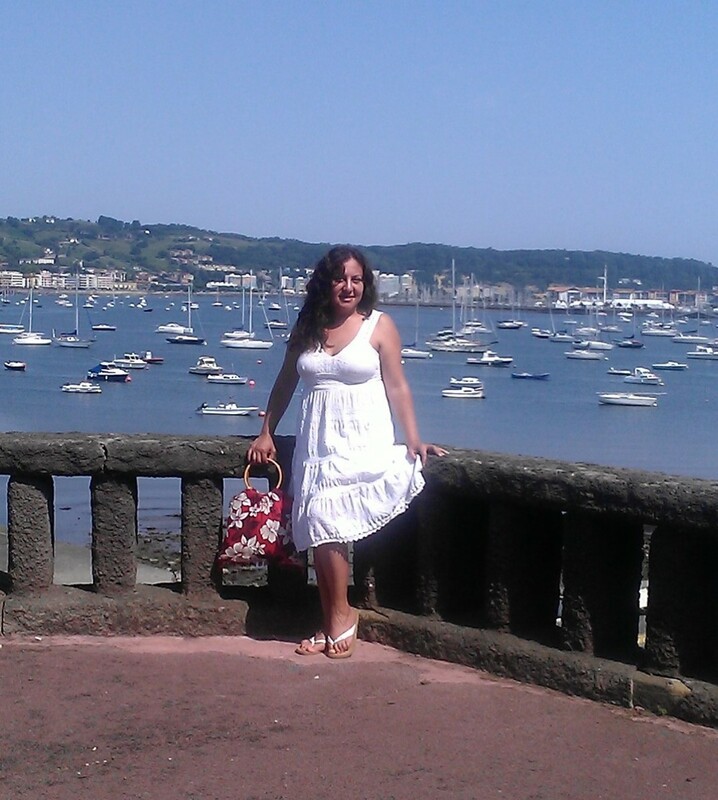 Tied the sarong at chest level to form a tube dress. Tied on one shoulder for the toga look. Looking closely at the toga knot. There are many ways for a Batik Sarong to be utilised. Of course for Malays, it is an every day usage item. 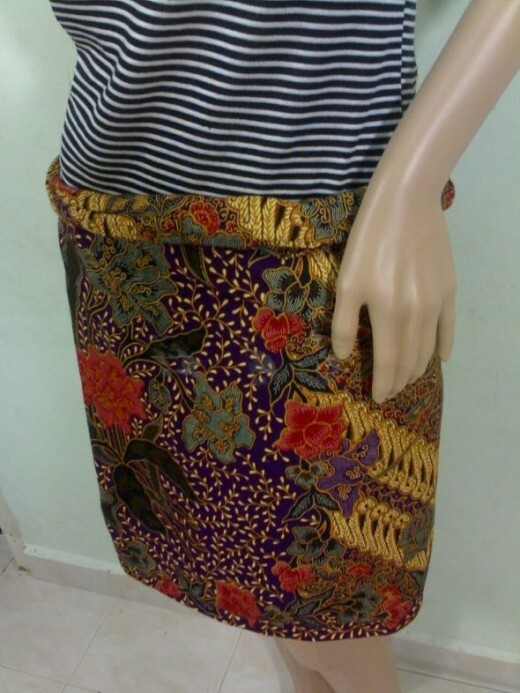 For ladies it is used as a skirt paid maybe with a comfy t-shirt at home or the glamorous kebayas for formal functions. For the outsiders, batik sarong is more of a beachwear, a cover up for the bikinis and such. A simple spread of batik sarong onto a table is wonderful in transforming a room into a tropical sanctuary. For an unsewn batik, just use the length of batik to act as a curtain. It is also used as a wall hanging as each batik sarong is an art itself as each one is handblocked and therefore each piece is unique. Just lay the batik anywhere, it would look good be it at the beach or in the park. 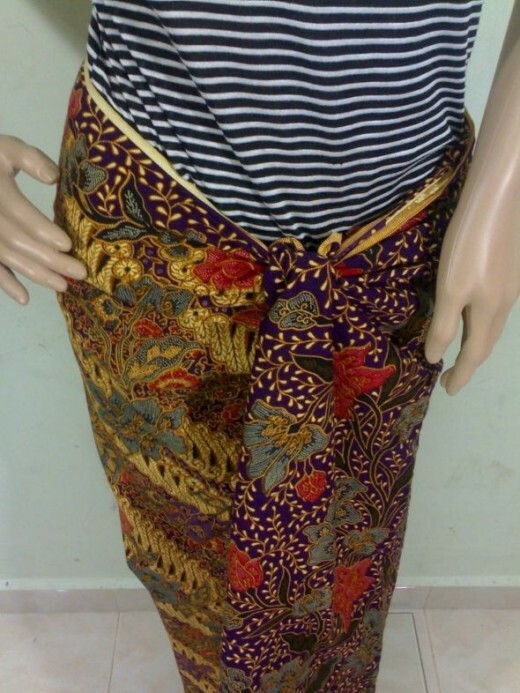 Nowadays, you can even find ready made pants made from batik sarong material. Else, just buy an unsewn batik sarong and based on your own body measurement, you can create a dress, a blouse, pants, skirts, bags.. the possibility is endless. You might also consider to make a cushion cover. Basically, a batik sarong with its different and beautiful pattern for its three part of bodies is wonderful for quiting projects. Long time ago, this is a traditional use of the batik sarong. Ladies would wear one sarong as skirts and another one as a shawl to protect the head from the sun as well as a modesty veil for the men that they like. In Asian contries, it is a common sightseeing a batik sarong to be fashioned into a hammock, attached to a spring and strung up on ceiling beams. I was one of those babies being swing to sleep using one of these buai (swing). 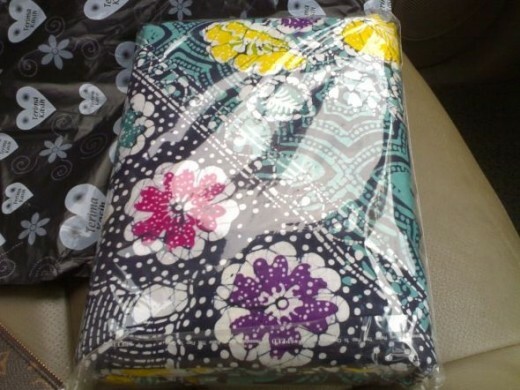 Nowadays, the role of batik has been replaced by a mesh sarong which enable better air circulation for the baby. Batik as a baby carrier or sling is easy to make. Just sling the batik sarong tube across your body. One side below one hand and another on your shoulder. Tie up the batik side for the sarong to ensure the sling is just right for your baby (I prefer toddlers) to sit snugly inside the batik sarong and towards you. Batik from the perspective of a non Malaysian. 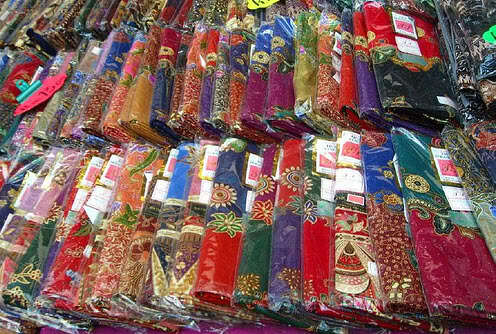 Marvelous collection of batik sarongs from Malaysia. 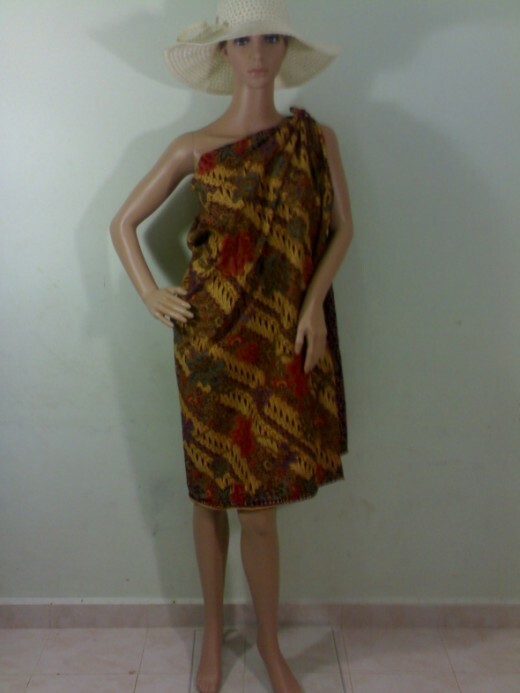 Would you like to wear the batik sarong? 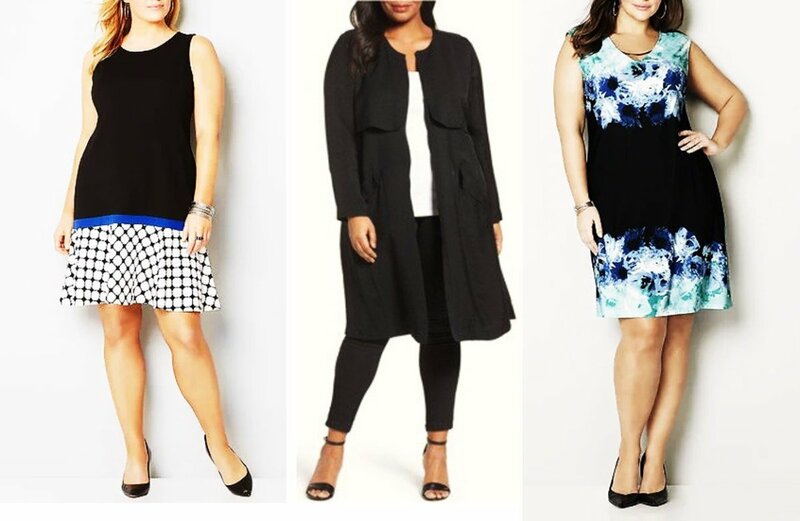 Would you use the batik sarong? What Do You Think of The Batik Sarong?